Fear. It’s real and sometimes it can paralyze us from really living. There are healthy fears in life that protect us from harm. There are other fears that deter us from living a life of experience and growth. It’s a bummer. Fear is defined as an unpleasant emotion caused by the belief that someone or something is dangerous. There are unhealthy fears that hold us back from experiencing the quality of life we were intended to have. Our state of mind and tendencies with fear lay the groundwork for how our kids will perceive fear and influence their approach. 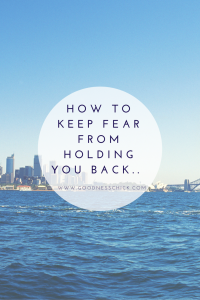 Being aware of how to keep fear from holding you back is significant and worth chatting about. Every single day we have choices, situations that we come face to face with sometimes we step up to the plate and sometimes fear calls our buff. This may come in the form of putting in for a position at work, pursuing a friendship / rebuilding a friendship, getting in shape, doing a run/ class, whatever, etc.Know that you can step up, you can stare fear in the face. When we do, crazy amazing things happen. In life we have fears. We would be lying to ourselves to say that we are fearless in all areas of life. There’s always something. The issue is when a fears exists that end up placing roadblocks in front of us. Bottom line? It deters us from living to our full potential. It cripples us in having the life we intended to have. I believe that if we maintain a life where we play it safe, are perpetually comfortable and we bob and weave from fear we are doing a disservice to ourselves and those around us. Life was not meant to be lived comfortably because in constant comfort there is no room for growth. One of my BIGGEST fears is heights. My stomach tightens and my hands get sweaty. It’s crazy. A decision I made awhile back was that I would not allow it to keep me from experiencing life. When I was in New Zealand I had a bucket list. On the top of my list? Bungee Jump. What? But you’re afraid of heights? Yup. Crazy uncomfortable with heights. As my toes hung over the platform ledge I peered down to the 300 foot drop below. The instructor informed me that I had to jump, they could not push me. I took a deep breath and allowed my body to fall forward. I spiraled downward and my heart raced as my body was free falling. In a matter of seconds my fear transitioned to total stoke. I was alive and had a rush that I could not even describe. I felt overwhelmingly filled with a sense of being alive, really alive. As my body bounced up and down awaiting to be unlatched from the cord there were absolutely no regrets. After that amazing plunge, you want to know what? I’m still fearful of heights. My fear didn’t disappear, but I did not allow it to prevent me from pushing myself and doing something intense, uncomfortable and real. It was absolutely amazing. So I’ll ask you. What are your three fears that are holding you back right now?I’m going to challenge you to write them down. What do they look like? Are you comfortable with these fears existing? If you are, maybe you’re not in the season to take on this leap. If you aren’t then let’s step forward. Not allowing fear to be a factor…. Write these three fears down. One at a time, what are ways that you can make these particular obstacles crumble a bit? Come up with a few ideas. I encourage you to chat with a someone you trust and get their insight. Stick with them. Simply writing them down and thinking about what you want to do is awesome, but it has to be intentional. Give yourself a weekly ‘how can I dissolve this obstacle’ list…keep at it, fight for yourself. It’s crazy when we begin to go forward and face our fears how it allows us to see ourselves as having greater potential, worth and we grow. Know that if we live in fear, people smell fear. What does this mean? If we wince when fear arises we pass on opportunity and growth. Those you live with, work with and socialize this will be in tune with these patterns. The biggest concern here? Our kids. If we are dictated by fear, it tells our kids that fear presides and they will struggle with living to their full potential out of fear. It can be scary, but we need to set an example of how to live fully, authentically and part of this is not allowing fears to conquer you. We have SO many kids afraid of challenge, fearful of success and paralyzed with emotion from the ‘what ifs.’ If I stay put I can’t fall. There is an overwhelming number of our young people ruled by fear. Fear is a factor and it’s heart breaking. There is risk in living. Fear will never not exist. The key is learning to allow it to drive you. It’s applying for that job that you think you may not get. Or it’s taking that higher level course, chatting with a teacher about a grade you may not agree with. How about trying out for that team or club that interests you. Life is scary. Uncertainty is uncomfortable. When we allow our kids to see the example we set in how we handle fear it’s an encouragement. It’s also the green light in saying you can do it, take that risk and go, go, go. How great is that? If we choose to allow fear to drive us academically, socially and financially there’s only one outcome. We shift blame and overcompensate with the blame game. If we are scared to go forward it’s SO much easier to point a finger at someone else. It’s easier to cast blame on a situation or circumstance. Just say no to the blame game! For both us and our kids WE NEED to take ownership. Take risks. Take steps. Live. You will fall. Know that you will stumble, but you will also get up. We’re human and when we give ourselves permission to REALLY live it’s a beautiful thing. You will scrape your knee. There will be disappointments. These are a part of us. They can fuel our hunger for life or consume us. Know that it’s a choice. What are you going to choose? Refuse to allow fear to dictate your life. You got this!